Anjali Kumar has an infectiously bright presence. The corners of her eyes crinkle when she smiles and her curly teal hair bounces in rhythm with her steps. She said she has a lot to be happy about these days. She just joined a sorority and is making friends in her new faith community. Plus, she just added a new houseplant to the collection near her dorm room window — a philodendron named Phil. The sophomore neuroscience major may seem to have it all figured out, but she has worked hard to reach the peace she experiences now. Kumar has suffered from generalized anxiety disorder since she was young. Through a journey of multicultural and religious experiences, as well as efforts to find the right modes of treatment for her mental health, she’s improved her mental state and now advocates for others to do the same. Kumar’s troubles started when she was a child. Her family went through trying times, and eventually her parents divorced. She frequently found herself panicking and worrying. During her first semester at Pitt, her mental health worsened further. 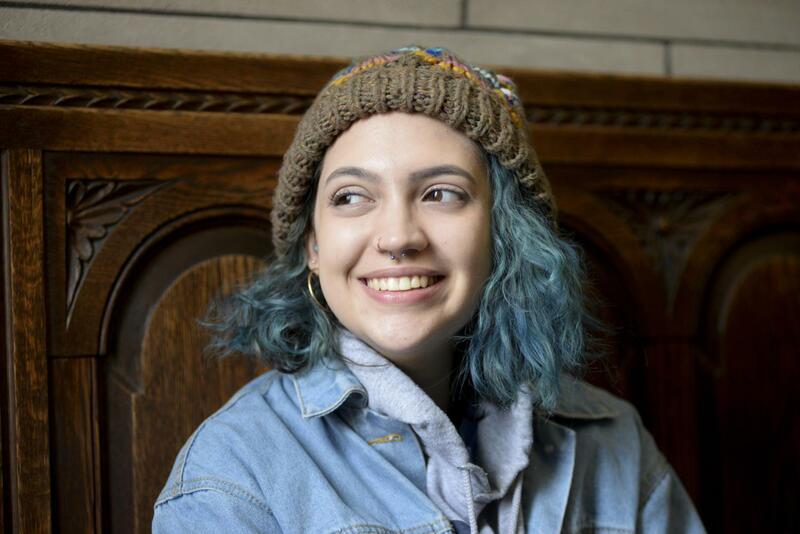 She sought help from the counseling center at Pitt but couldn’t find the help she needed there. But the center referred her to a psychiatrist who listened to her and helped her get on medication. Kumar questioned everything about the nature of existence as a child. As the only child of a biracial couple — the daughter of an Indian father and a white American mother — she used to ask her father questions about Hinduism and her mother questions about Catholicism. Her mom would jokingly tell her she asked too many questions to be Catholic. Kumar wanted to seek out religion as a child, even though her parents did not emphasize it much. Finally feeling more at peace living on her own at Pitt and being treated for her anxiety, Kumar began to explore religion again. “I wanted that community, and I wanted those answers,” she said. So, she started asking the same questions she always had as a child. In between or during classes, she researched different religions, one by one over a period of months. Because of her exposure to Hinduism through her father’s family and her friends, Kumar began her search there. But Kumar couldn’t get comfortable with the concept of polytheism. She wanted to know why there were so many iterations of God. Shifting her focus toward a related but monotheistic faith, she researched Sikhism. Islam was the next religion on the list. Kumar admitted she was wary at first, referring to the often frightening portrayals of the religion in the mainstream media. After learning more about the religion, meeting with Muslims in the area and visiting a mosque, Kumar was almost ready to commit to Islam. But she had one worry. She wasn’t sure whether her sexual orientation would jive with her new religion. Crying, Kumar visited the local imam — an Islamic scholar — to ask his opinion. Kumar converted to Islam in the middle of last year and has continued to learn about it since, making Muslim friends at Pitt and continuing to read the Quran in her spare time. She wants people to know that identifying as LGBTQ+ shouldn’t prevent one from pursuing religion. She has found new friends in the Pitt Muslim Student Association who are supportive of her views. Yosra Kandil, a junior history major and Kumar’s fellow member of the Muslim Student Association, said Kumar’s admired her character and bravery in speaking about her experiences with mental health. Amal Saeed, a junior majoring in global studies and molecular biology and the Pitt MSA president, was impressed by Kumar’s openness. “I really admire her confidence and willingness to be open with other MSA members, and I think that that has contributed to how well received she has been,” Saeed said. Kumar still takes medication and goes to therapy for her anxiety. She’s also started practicing dhikr, an Islamic meditative practice, to help her “stay grounded.” The treatments and new sense of community help her to focus on the things she enjoys doing in life — asking questions about our existence and purpose, spending time with her sorority sisters, volunteering at the hospital and taking care of her ever-growing collection of houseplants.